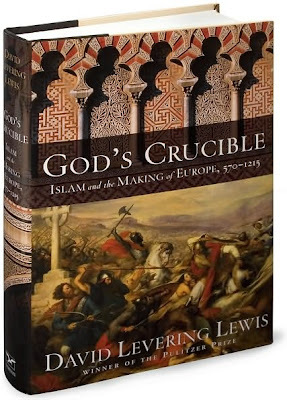 God’s Crucible: Islam and the Making of Modern Europe, 570–1215, David Levering Lewis, Norton, 473 pp. David Levering Lewis's rich and engaging God's Crucible shows that it took two things to make Europeans think of themselves as a people. One was the creation of a vast Holy Roman Empire by the six-foot-four, thick-necked, fair-haired Frankish warrior king we know as Charlemagne. The other was the development, in the Iberian peninsula on the southwestern borders of his dominion, of the Muslim culture of Spain, which the Arabs called al-Andalus. In the process that made the various tribes of Europe into a single people, what those tribes had in common and what distinguished them from their Muslim neighbors were both important. This is, by now, a familiar idea. But God's Crucible offers a more startling proposal: in making the civilization that modern Europeans inherit, the cultural legacy of al-Andalus is at least as important as the legacy of the Catholic Franks. In borrowing from their great Other, they filled out the European Self. Charlemagne's rule included at its high point most of France, Switzerland, Belgium and the Netherlands, the west of Germany, Italy as far south as Rome, a strip in the north of Spain, and parts of Hungary and the Balkans. At nearly three and a half million square miles, it was larger than the continental United States. Charlemagne imposed Catholic orthodoxy on the pagan Saxons in the east at the point of a very sharp sword, massacring thousands of those who resisted, and suppressed heresy within Frankland with equal vigor. He created monastic centers of learning, drawing scholars from across his empire and beyond; and after the centuries of ignorance that had followed the collapse of the Roman Empire in Gaul and Germania, the works of men like the Northumbrian Alcuin (poet, theologian, and restorer of the classical curriculum) created a Carolingian Renaissance. These achievements perhaps entitled Charlemagne to his self-conception as Rome's heir in the West, author of a Renovatio Romani Imperii, an imperial restoration. When he traveled to Rome in December 800, some thirty years into his reign, he went to defend the authority of Leo III as pope; and His Holiness returned the favor by crowning him Emperor of the Romans on Christmas Day 800 (much to the annoyance of the Byzantine regent Irene, who called herself Emperor, rather than Empress, and thought the title was hers). Charlemagne was a great soldier, a devoted Catholic, an ambitious administrator, and a patron of learning. He had reason to take pride in what would prove a brilliant Carolingian legacy; we need think only of the magnificent carved ivory plaques in the Cloisters of the Metropolitan Museum or the elegance of manuscripts in Carolingian minuscule or Alcuin's Latin verse history of York. But the empire he created was, as Lewis puts it trenchantly, "religiously intolerant, intellectually impoverished, socially calcified, and economically primitive," ruled by a "warrior caste and its clerical enforcers." Despite the new currency, the economy was dominated by barter; there were few cities of any size; and wealth was measured in land, peasants, and slaves. Charlemagne had no national system of taxation. He lived off plunder and the product of his own estates. What his lords owed him was military service. They were obliged to show up annually in the late spring, armed for a military campaign, in case he thought it necessary. (Very often, he did.) The Franks had once been a relatively free agrarian people; now they were largely a nation of serfs, working alongside slaves—many of them Slavs from Bohemia and the southern shores of the Baltic. much of this royal centralizing had scarcely more than a parchment reality in a world of near-universal illiteracy, deep suspicion and resentment on the part of the nobility, and a crippling disparity between resources and objectives. The fact is that Charlemagne's empire, impressive as it was, lacked many of the marks of what we think of as civilization: cities, commerce, great libraries, a literate elite. This is especially clear if we compare the world he made with the cultivated society of his new Muslim neighbors.